Lauren Willig is celebrating the release of The Betrayal of the Blood Lily by having a contest where you can win an advance view of next Pink Carnation book, The Mischief of the Mistletoe. Jeri Westerson has posted the first look at the cover for her upcoming book, The Demon's Parchment, which is the third book featuring disgraced knight turned tracker, Crispin Guest. Lucy from Enchanted by Josephine is hosting author Julianne Lee, and has a giveaway of two copies of her book, Her Mother's Daughter. Lucy has also got a guest post and giveaway from Karen Harper, author of Mistress Shakespeare. 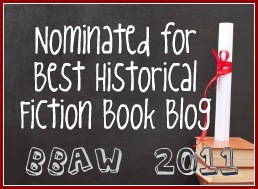 Allie from Hist-fic Chick also has a guest post, this time from Sharon Latham, and there is a three book giveway. You can win a copy of Mr. and Mrs. Fitzwilliam Darcy, Loving Mr. Darcy and My Dearest Mr. Darcy. Martina from She Read a Book is giving away a copy of Mr. Fitzwilliam Darcy: The Last Man in the World by Sharon Latham. There is also a guest post from Sharon Latham. In case you don't recognise the blog name, Martina used to blog as Virginie under the blog title Virginie Says, but has recently changed her blog name! Lizzy from Historically Obsessed is featuring a Q and A with Kate Emerson about her new book Between Two Queens. those are some great events going on!